The Cancer Research Institute (CRI), a nonprofit organization dedicated to fueling the discovery and development of immunotherapies for all forms of cancer, has selected Rafi Ahmed, PhD, to receive the 2017 William B. Coley Award for Distinguished Research in Basic Immunology. Ahmed is director of the Emory Vaccine Center, professor of microbiology and immunology in Emory University School of Medicine, an investigator in the Emory Center for AIDS Research, and a Georgia Research Alliance Eminent Scholar. CRI will bestow its highest honors on Ahmed for his fundamental contributions to the fields of immunology and cancer immunotherapy. The award will be presented at the Institute's 31st Annual Awards Dinner on Tuesday, Nov. 14, 2017 at The Plaza Hotel in New York City. 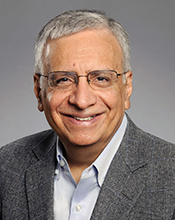 Ahmed, a member of Winship Cancer Institute of Emory University, is recognized for his seminal work on immune memory as well as his definitive studies on the role of the PD-1 receptor in T cell exhaustion during chronic infection. His work significantly influenced the clinical development of anti-PD-1/PD-L1 immunotherapies, five of which have now received FDA approval in the treatment of cancer. Notably, one of these became the first cancer treatment ever to be approved for cancers with a specific genetic biomarker, regardless of their origin. "Beginning in the 1990s, Rafi Ahmed laid the immunologic groundwork for breakthroughs leading to new practice-defining immuno-oncology approaches to many types of cancer," says Walter J. Curran, Jr., MD, executive director of Winship Cancer Institute and a Georgia Research Alliance Eminent Scholar. "These therapies are contributing to longer and better lives for patients, and we believe ongoing PD-1 research, which is continuing at Emory through collaborations between Dr. Ahmed and other Winship investigators, will lead to even more effective therapies." The William B. Coley Award for Distinguished Research in Tumor Immunology will be presented to Thomas F. Gajewski, MD, PhD, of the University of Chicago. Ahmed and Gajewski each will receive a $5,000 prize and a gold medallion bearing the likeness of Coley. Shannon J. Turley, PhD will receive the 2017 Frederick W. Alt Award for New Discoveries in Immunology. CRI established the William B. Coley Award in 1975 in honor of Dr. William B. Coley, now regarded as the Father of Cancer Immunotherapy. His daughter, Helen Coley Nauts, founded the CRI. Award winners are nominated by CRI's Scientific Advisory Council and former Colley Award winners. To view a complete description of past Coley Award recipients, go to the CRI website. The Cancer Research Institute, established in 1953, is the world's leading nonprofit organization dedicated exclusively to transforming cancer patient care by advancing scientific efforts to develop new and effective immune system-based strategies to prevent, diagnose, treat, and eventually cure all cancers. Guided by a Scientific Advisory Council that includes three Nobel laureates and 25 members of the National Academy of Sciences, CRI has invested $344 million in support of research conducted by immunologists and tumor immunologists at the world's leading medical centers and universities, and has contributed to many of the key scientific advances that demonstrate the potential for immunotherapy to change the face of cancer treatment. More information about PD-1 work at Emory is available in Winship Magazine.